The magazine said it picked people “who inspire us, entertain us, challenge us and change our world.” And not always for the better. Included on the list were Syria president Bashar Assad, North Korean dictator Kim Jong Un and Mullah Mohammed Omar, spiritual leader of the Taliban. Somali Islamic militant Sheik Moktar Ali Zubeyr was included in the “rogues gallery,” too. Anonymous, the controversial Internet “hacktivist” collective, won the magazine’s online poll for its inclusion on the 2012 list. There are 38 women on the 2012 list, more than any other year, Time said. Adele, Rihanna and “Saturday Night Live” star Kristen Wiig made it, while singer Lana Del Rey–the Internet sensation who had been nominated–did not. As with any list, there were other snubs: Romney and fellow Republican presidential candidate Ron Paul were selected, but Newt Gingrich was not. Stephen Colbert, Time decided, was more influential than Jon Stewart. There were a few questionable–though not unworthy–inclusions with ties to Time. Former editor Walter Isaacson, who penned Time’s cover story on Steve Jobs’ death–made the list for his biography of the late Apple founder. Mashable founder Pete Cashmore—whose site was rumored to be close to a sale to Time-corporate sibling CNN earlier this year–made the list for the first time. But it is the qualities that Tim, 24, embodies in his life off the field that truly set him apart. He is unashamed of his convictions and faith, and he lives a life that consistently reflects his values, day in and day out. Through his foundation, he constantly reaches out to people and communities in need of hope. He realizes what he has been blessed with and seeks to help those who are worse off. As athletes, we pour our hearts into winning games. Tim is a reminder that life is about much more than that. 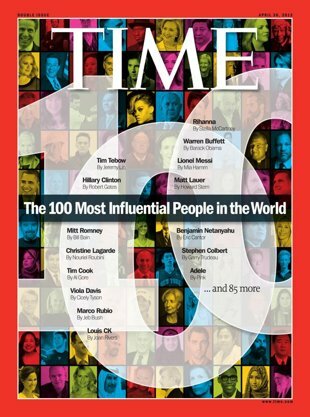 Click here for complete Time 100 list. Next: Lionel Richie Makes it to No. 1 After 25 Years!